Yesterday I went to a wonderful event at the equally wonderful Daunt Books on London's Marylebone High Street. The event – titled ‘Capturing a Sense of Place’– was the last of Daunt Books’ first two day ‘spring books festival,’ and the lovely old bookshop was crammed to the rafters with people who had come to hear a conversation between four very interesting writers. Mahesh Rao, a debut novelist who has written about the city of Mysore in India, where he currently lives; distinguished travel writer, Colin Thubron; celebrated historical novelist, Tracy Chevalier – author of Girl with a Pearl Earring, which was first launched at Daunt Books, were all in conversation with travel writer and historian, Barnaby Rogerson, who also runs the well known Eland imprint, which specialises in keeping great travel classics in print. The conversation was a fascinating and insightful exchange in which all four writers spoke of their own notions of place and what makes for good descriptive writing in both fiction and non-fiction. Each seemed to agree that whilst fiction allows a greater freedom one’s descriptions of place need to be based in reality in order to be believable, and similarly in non-fiction too – particularly in travel writing – the ring of authenticity does more than make a descriptive passage simply credible, it need not be embellished or dramatised in order to make it evocative or informative. Indeed, as Colin Thubron noted not all aspects of travelling are necessarily that interesting – most journeys are characterised by long periods of tedium and boredom. Mahesh Rao commented that he thought this made the prospect of writing non-fiction, such as travel books, prohibitively daunting: “What if you go on a journey and nothing interesting happens to you? !” – That, Colin Thubron said, was the travel writer’s greatest fear: “Most people think a travel writer’s fears will be about the possible dangers of travel, but actually the greatest fear is that nothing dangerous will happen – at least if everything goes drastically wrong you’ll have lots to write about!” However, even the tedium and the boredom have their place too. Thubron cited how a stagnant and unproductive month in China was condensed in one of his books into a couple of paragraphs, the trick is knowing how to balance this properly within the narrative – you don’t want to bore the reader, but you still need to give them a sense of that reality which makes for genuine authenticity. Tracy Chevalier made several interesting points. Firstly, how she thought we all have a tendency to “anecdotalise” our lives – essentially we all tell stories based on our experiences. She gave the example of how we tell stories about things which happened to us whilst we were on holiday and how in subsequent retellings we will instinctively trim the edges and tidy the parts which didn’t work or lessened the impact, and in that sense we begin to shape our own stories – good writing is much the same, it’s a process of honing a story or a telling of something personal into its most affective essentials. For her – she said – she thought good travel writing was all about finding the right mix of “person and place.” The other writers on the panel all agreed. A good travel writer needs to convey something of themselves, their personalities, and their responses to the places in which they find themselves and which they are describing in their prose. Colin Thubron gave the example of how when he began writing “as a younger and perhaps less confident man” he chose to write about small places essentially because he felt he needed to know all about them first and these were easier to research and read up on – yet later, when he ventured to take on bigger themes and bigger places, such as the Soviet Union and China, he realised that not knowing all about them could be part of that process of writing – it became more about journeys of discovery and feeling, rather than simply factual journeys of straight reportage – essentially a mix of the two tends to work best. Each writer read an extract of their own work and an extract of a work which had resonated with or inspired them in some way. It was interesting to hear their choices and the conversation naturally progressed on to the idea of how travel writing has grown and evolved over time, how so many writers and publishers have long been announcing the demise of the genre, and yet its resilience seems to constantly keep it bouncing back. The panel were asked to speculate about the future of travel writing. The idea that travel writing was becoming less vital now that we can all travel, or, if not, we could all certainly access far away places on-line – ‘googling’ up images and footage of what these places look like rather than seeking out descriptions in travel books. Tracy Chevalier said she was concerned that the speculative demise of good travel writing would leave writers of the future without access to what we make of travel now, worrying (rather dismissively, I thought) that – “now that we can all write about our travels so instantly on-line” – such future writers would only have “personal blogs and Tripadvisor” to rely upon, and that largely there was “no good writing of that sort to be found on-line.” This was the only point of the conversation that I would take issue with – not simply because I write a blog about my own travels, naturally! – but because I think it is manifestly untrue. There is plenty of good writing being posted on-line both by established or emerging writers and ‘amateurs.’ And as a historian I’d say that such blogs and Tripadvisor, should they remain accessible, will become as useful as future source materials as the newspapers and popular press journals of the past are to us now. Future writers and historians will no doubt have the critical facility to sift and differentiate what’s valuable from what is less useful. Colin Thubron stated that he thought the greatest strength of the travel writing genre was its great adaptability, and that essentially it all came back to Tracy Chevalier’s point that good travel writing was all about finding that balance of “person and journey” – this was ultimately what shone through in the end, it’s what we all relate to in good travel writing, and therefore what makes it endure. It was an excellent, thoughtful, and thought provoking conversation which made for a very enjoyable evening (accompanied by a very enjoyable glass of wine too!) – an excellent end to what looked like a great list of events. 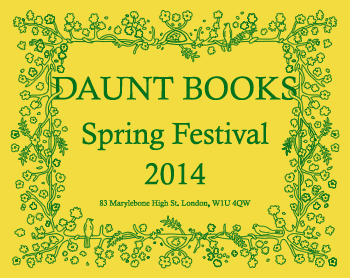 Hopefully it will be but the first of many such spring festivals at Daunt Books.